Rain was inevitable on this trip, especially on this southwestern coast. The Southern Alps rise up to the east, and the long carving rivers connecting to the ocean between the rising peaks create huge funnels for the weather to just pour down. Today though, brought rain all day and all night, in buckets, for better and worse. At first it seemed such an unfortunate time to pass through, unable to see any of the upper mountains. 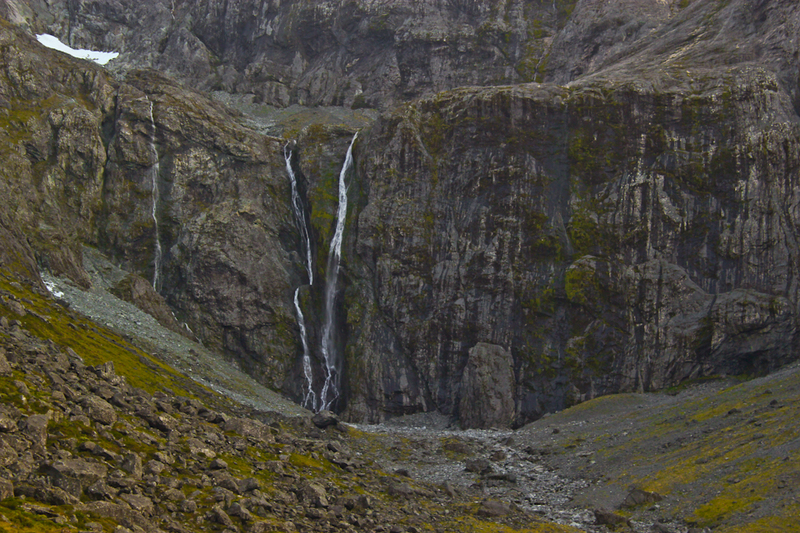 Instead though, as the day wore on, we saw more and more temporary waterfalls, thousands of feet tall, funneling the incessant rainfall down to the valley floor. Eventually, I decided to head out on the one and only hike deemed worthy in such weather. As it turns out, I think the weather was infinitely better for this hike than a sun filled sky ever could have been. I ran most of the hike, half of the time shin deep in the freezing water. Most of the time, the difference between a stream and the track was a very blurry line. But the real beauty was when you looked up, stung by the water drops that pierce your face, among the thick bed of clouds looming above were literally hundreds of waterfalls. No joke, over a thousand feet tall each, surrounding you in every direction. Both the sight and sound were mesmerizing. The only bummer of the hike was that when I finally stopped to take pictures of all of this, I reached in my “waterproof” pocket only to feel a puddle of water in which sat my camera. Memory will have to do. Ahhhh, my friend Gertrude…..seems she was in a wet mood, eh!